Konica Minolta is pleased to announce that it has won a 2008 Annual Award for Exceptionally Trustworthy Enterprises in China. This award is given to companies in China that have earned the confidence of society. The China Enterprise Confederation and the China Entrepreneurs Association select the recipients of this award. The award is given to companies that carry out confidence-inspiring corporate activities in China based on an exceptional philosophy and outstanding management. The candidates must actively fulfill corporate social responsibilities (CSR), and be well respected by society. For 2008, about 100 companies were selected from various industries, and Konica Minolta was chosen among those in the information device and optical component manufacturing industry. Around the world, Konica Minolta has been providing support for the Pink Ribbon Campaign, which promotes greater awareness and early detection of breast cancer through exams. Its efforts have been recognized also in China. In 2006, the company supported the Chinese government's Project for Breast Cancer Screening for a Million Women by donating phase-contrast mammography (PCM) X-ray systems to hospitals in Beijing and Shanghai. Konica Minolta is providing necessary X-ray supplies free of charge to the Shanghai Project for Free Breast Cancer Screening for 10,000 Women, a five-year project that began in 2008. 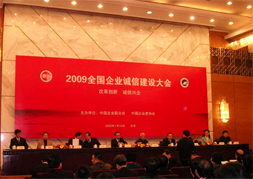 Konica Minolta also sponsored the Women's Health Forum in Shanghai in 2007 and in Beijing in 2008. The forum is a series of lectures to deepen the awareness of Chinese women concerning their health issues. When the Sichuan earthquake struck in May 2008, Konica Minolta immediately provided financial support for the relief effort, and then also donated medical imaging devices to medical institutions in the area to help with reconstruction efforts. The Konica Minolta Group companies have also been contributing to Chinese society in various ways, including support for culture, sports, environmental protection, and education. The recent award is in recognition of these activities, and was presented to Konica Minolta (China) Investment Ltd., as a representative of the Konica Minolta Group, at the 2009 National Enterprise Credit Construction Conference, held in Beijing. Konica Minolta will continue to actively pursue CSR activities as a global company in order to earn greater confidence from people around the world.